So, not that much has changed since the last mock draft, right? I mean, we only have a new team selecting with the first overall pick. Now, after the Los Angeles Rams have jumped from 15 to one in a blockbuster trade with the Tennessee Titans, how does the landscape look now with only one week to the draft? As we noted in the intro, the Rams will now be the point man of the draft but while we know that they will be taking a quarterback, it is less certain which quarterback that will. I have been thinking all along that Wentz will be the first quarterback selected and I have no reason to back off that thought now. 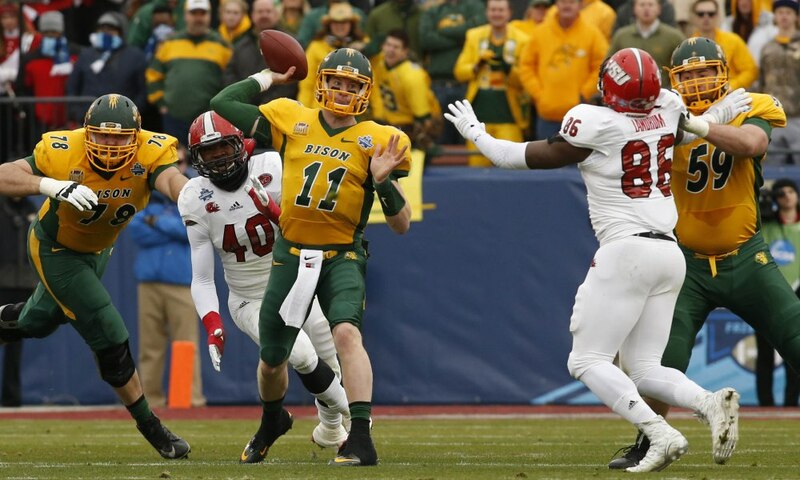 It will be a big jump for Wentz from Fargo to the NFL but he definitely has the tools to make it work. He has got the ideal size and arm that you like to see from your franchise quarterback plus some solid mobility as well. Cleveland came out as the big loser in the Rams-Titans trade considering now they have to settle for the quarterback that the Rams don't pick, which may not be the guy they prefer. Of course that's pending whether the Browns will indeed take a quarterback but I do think they will. And if they do, that guy is going to be Goff. Some consider Goff to be the top quarterback in this draft thanks in part to his quick release and his accuracy, although he can get a little inconsistent in that regard. One of the winners of the Rams-Titans deal could end up being the Chargers because they now have a strong chance to be able to draft the left tackle that they desperately need. After all, their pass protection is important given that Philip Rivers is not getting any younger. Tunsil has all of the tools that a franchise left tackle should have, namely the size, athleticism and footwork. I have read some concerns that he is nasty and aggressive as folks want, so there's that. There has been some rumor mongering that Ramsey could be the top pick in the draft not too long ago, and now he could fall to the fourth pick (if not further). For a Cowboys team that could use some reinforcements on the defensive end, they will have some options here but I think they will take the best defensive player in the draft. Now we're not sure whether Ramsey will be a corner or a safety at the next level, I think he should be a safety for what it's worth, but his size and his athleticism will make him a factor wherever. Jacksonville showed some improvement this past season but we are still waiting for them to make that jump in the win total. One of their big problems remains their defense which was in the second half of the NFL statistically yet again, despite Gus Bradley's defensive background. Therefore, they'll likely go defense again early and Jack should provide some pop to a linebacking corps that could certainly use some. Jack is an elite talent. He has the athleticism to make plays all over the field and he has the instincts to be in the right spot at the right time. Ozzie Newsome is famous for being a shrewd personnel exec and one of the reasons why is that he is a good drafter. He is also not afraid to take the best player available regardless of need and in that case, Buckner would apply and better yet, he would help fill a need after a declining Chris Canty was cut. Buckner, who was named the top defensive lineman in the Pac-12 for 2015, should be able to contribute all over the defensive line thanks to his size, length and strength and he should fit well in a 3-4 or a 4-3 defense. With either of the top two quarterbacks expected to be off the board by the seventh pick, and with them not looking like a fit for Paxton Lynch, San Francisco is in a bit of an interesting spot. One of the top defensive prospects will probably be available and if it is Bosa, I think they'll scoop him up quickly. After all, the team was the fifth worst team in the league at getting sacking the quarterback. He has a good mix of power and agility and there has been some talk that maybe he could line up at outside linebacker in a 3-4. It still is a little bit crazy that the Eagles would successfully get rid of one of their more onerous contracts, that of cornerback Byron Maxwell, and move up in the draft as a result. It's safe to say that the Dolphins got fleeced here while the Eagles could have their opportunity to draft a replacement for Maxwell, or draft a replacement for the also-traded DeMarco Murray. Elliott, after a stellar Combine performance, is going to go higher than I had previously thought but with his skill-set, it makes sense. It seems like the pass rush has been a problem area for the Buccaneers for so many years on end now and even as they weren't as bad last year as they have been in the past, it still could certainly be better. And after all, even with how good Gerald McCoy is, he can only do so much. Even after shelling out some coin to bring in Robert Ayers, they should look to bring in another pass rusher especially considering today's NFL. Lawson plays with enough energy to spare and he has a great nose for the football. The Giants paid some big bucks to bring in Rams cornerback Janoris Jenkins this offseason to replace Prince Amukamara and he should pair with Dominique Rodgers-Cromartie to form a solid combination. That said, the bench behind them is lacking and in this day and age, you can never have too many quality cornerbacks, and especially so for the league's worst pass defense. Hargreaves did have some up and down moments down the stretch of his junior season with the NFL seemingly on his mind and isn't particularly big but he does have great ball skills and the aggression you like. Chicago needs to upgrade their offensive line and it should start at the tackle positions. Kyle Long, the right tackle, fits much better at guard while left tackle Charles Leno can be improved upon. Stanley fits more as a left tackle than on the right side as he isn't a mauler in the running game. However, he is terrific in pass protection and has the length and agility to excel on the left side. All of that said, his stock may slip some due to concerns about his work ethic. New Orleans was atrocious defensively last season, only being saved from the cellar by the Giants. The Saints finished second to last against both the run and the pass so they could use more than just a little help. The team could really use a true force in the middle of their defensive line and a guy like Rankins that is good against both the run and pass should be a big help. Rankins is not the biggest tackle in the world as he's only 6'1" and barely 300 pounds on a good day but his penetration skills will make him a fun player to watch. As mentioned already, the Dolphins made that bizarre trade with Philadelphia to bring in Byron Maxwell and given how he played last season, I am not sure how big of an upgrade he will be over some of the crap they threw out there opposite Brent Grimes. Also of importance was the fact that Grimes really wasn't all that great himself so the cornerback position early should be one of the positions they look to address early. Jackson is not the best tackling corner I have ever seen but teams love corners of his size that can run like he can. Imagine how good the Oakland pass rush would be if they had a dangerous threat opposite of Khalil Mack? Considering how good Mack was last season with 15 sacks, only finishing tied for 14th in sacks was a little disappointing. Given that Aldon Smith will be suspended for a good chunk of the season, the Raiders should look to take a pass rusher early on. Given his size and struggles against the run, he may be forced to play at linebacker instead of end even in a 4-3 but his quickness off the edge make him a tough blocking assignment. One of the curiosities of the Titans' trade down to the 15th pick is what will they do with this pick. I think they could still look to take a tackle. After all as we all know, their foremost priority is protecting Marcus MAriota and they do have a hole at the right tackle spot opposite of Taylor Lewan. Fortunately for them, Conklin looks like a better fit for the right side anyways considering he is probably not quick enough for the left side. However with his power, he should be either a quality right tackle or line up inside at guard. Detroit failed to adequately replace both Ndamukong Suh and Nick Fairley last offseason and their defense suffered as a result, most notably in the running game. Haloti Ngata was not able to help the cause so the Lions should look to take one of the well regarded inside defensive lineman. Reed is a stout run stuffer as he showed in Tuscaloosa and given how disappointing the Lions' run defense was this past season, he should certainly help the cause. Dan Quinn is a well-regarded defensive coach but I don't think he will be able to have big success with this personnel until they get some playmakers at linebacker. Brooks Reed is a solid player but beyond him, there's not a whole lot there even after bringing in Courtney Upshaw and Sean Witherspoon in free agency. Lee has only played the position for a few years but he has got the instincts and physicality to be a big time playmaker and play on all three downs. Of all the things you can criticize GM Ryan Grigson for, arguably he biggest thing is that he has consistently failed to put together a quality offensive line. That's not a good thing for any franchise but for a team that has a young franchise quarterback in Andrew Luck, who has taken a lot of hits in his career thus far and had missed games last year, that's a serious concern. Decker not only has the size you want out of your left tackle but also has solid athleticism. He is very good in the run game as well. Considering that Tyrod Taylor had himself a surprising 2015 in his first season as a starter, even somehow becoming a Pro Bowl alternate, it seems a little surprising that has been the rumors that Buffalo has been looking to take a quarterback early. That said, the contract negotiations that are still ongoing between the two parties probably doesn't help matters. As a result I think that should Lynch be available here, Buffalo won't pass on him. He is likely not ready to play right away but he has got the physical talents to excel as a starting quarterback. Lynch has impressed many with his ability to operate outside the pocket. Even with one of the more loaded defensive fronts in football, the Jets only finished 12th in sacks this past season. That goes to show how much they could use a real pass rushing force coming off the edge, the likes of which they have not had in many years it feels like. Considering that Spence got kicked out of the Big Ten after a couple of negative drug tests, the off-field issues will have to be monitored but there is no question that this guy has got a gift for getting to the quarterback, whether as an end or in a standing up position. Washington surprised many this past season in winning the NFC East and advancing to the playoffs this past season but one aspect of the team that did not help the cause that much is their run defense. For the season statistically, they were 26th in yards per game and tied for 30th in yards per attempt against the run. They'll need some reinforcements on the defensive line as Terrance Knighton is now a Patriot. Robinson's run stuffing abilities should replace Knighton's well and there is some hope that he could develop some pass rush action as well. It appears that after many years looking for a real option at the quarterback position, the Texans hope that they have found their man in Brock Osweiler. It would be a surprise if he wasn't an upgrade over the crap they have put at the position the last two seasons. The supporting cast around him is getting better after they brought in Lamar Miller but they need a weapon opposite DeAndre Hopkins. Fuller had himself a great combine and should he cut down on the drops, he could be a dangerous deep threat. Stefan Diggs was a revelation as rookie in 2014 but beyond him, the Vikings don't have a whole lot for young quarterback Teddy Bridgewater to work with as Mike Wallace failed to make much of a serious impact. I used to think that it would be a surprise for Treadwell to be available here but this seems to be more likely of a range for him that perhaps previously thought. Treadwell may not have the high-end speed but he is a natural receiver thanks to some tremendous body control. He also has the physicality to get open and should be a factor in the red zone. Even with one of the top receivers in football in A.J. Green, the Bengals still have a need at the position. They only had him and Marvin Jones last season, and now Jones is a Detroit Lion. Even with this run of receivers in the draft, the Bengals should be in solid position to draft one considering that there are a number of guys that should be available here. He will be older than your average rookie at 24 but he has terrific hands and very good body control which should help him in the red zone. The Steelers laid claim to the third worst passing defense in the NFL this past season and they could really use some reinforcements to their secondary, especially as Brandon Boykin and William Gay are free agents this offseason. The Clemson product is a terrific cover corner thanks to his man-to-man game and his athleticism. Pittsburgh had their representatives at Alexander's pro day and reportedly were impressed. Therefore, he shouldn't fall past here. Seattle could certainly use more help along their offensive line and they have some big needs at the tackle position. Left tackle Russell Okung has a clear injury history, as he has never played a full regular season, and he is also a free agent. Right tackle Garry Gilliam simply isn't very good and they also need to improve their guards as well. Ifedi probably should have spent another season at school but he has the ideal build for an offensive lineman and he is very good in the run game. Clay Matthews is one of the most important players on the Green Bay defense and due to how bad the inside linebackers have been for them, he has had to spent much of the past two seasons out of position inside. Green Bay will go defense early and bringing in a talented inside linebacker will allow Matthews do what he does best while upgrading the defense at large. They would be ecstatic if Ragland fell to them. Ragland has a lot of attributes that should make him a solid NFL pro, most importantly his excellence against the run. Marcus Peters was terrific as a rookie for the Chiefs last season but now as Sean Smith has signed with the Raiders, the team now has a big hole opposite him. Considering how this league has become so quarterback-driven, you need to have strong corners so look for Kansas City to draft one early. Apple has the ideal size that you want out a cornerback and he is both athletic and physical. He may fit best in a press coverage scheme. Arizona had the fifth best defense statistically this past season and it played a huge part in their run to the NFC Championship Game. But even then, they failed to adequately replace Darnell Dockett on the defensive line after releasing him a year ago. Butler could be that replacement. It is doubtful as to whether he will make a big impact in rushing the passer but he is one of the top run stuffers in this draft. He has the versatility to fill a number of roles on the defensive line. The Panthers had the sixth most sacks in the league last season but now with Charles Johnson on the decline and Jared Allen retiring, they could use somebody opposite of Kony Ealy so that their pass rush does not miss a step. Dodd did not make a big impact at Clemson until the 2015 season in which he put together 12 sacks and over 23 tackles for loss. He is probably not ready to play right away but the Panthers can afford to be patient. As expected after forking out some paper to retain Derek Wolfe, they were unable to re-sign fellow defensive lineman Malik Jackson, who promptly cashed in with the Jaguars. Therefore, I think they'll be on the hunt for a replacement come draft night. Nkemdiche had that bizarre incident and was suspended for the Sugar Bowl thansk to a marijuana citation and there are questions about his drive. That said, he is one of the more talented lineman in the draft and if he puts in the effort, he could be dominant. For more mocks, check out the database at Walter Football.